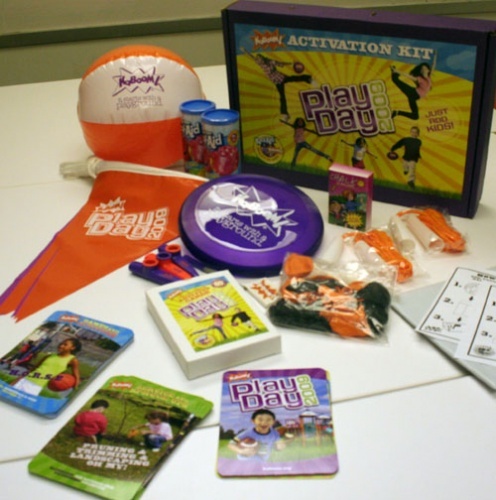 This week, I got a sneak peek at the final version of the Play Day Kit. And I have to tell you...It is just. So. Cool! I had to share it with you. With the blessing of our marketing department, I borrowed the kit for an hour, took some photos, and checked out all the cool stuff inside. I knew it was going to be awesome. I'd heard all about it beforehand and knew exactly what was going to be in it. 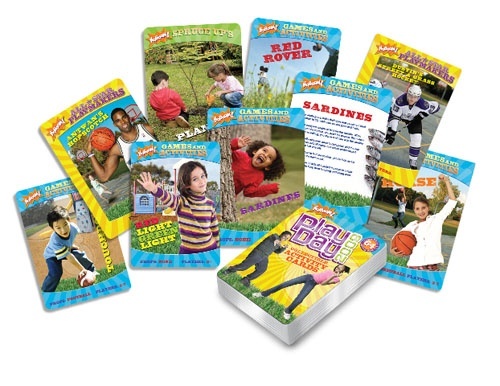 But when I actually saw how it was put together, and got to look through the Play Day cards...it made me instantly jealous of those folks who are planning a Play Day and will be getting one of these for free. So what's in the kit? Let's take a look. KOOL-AID! 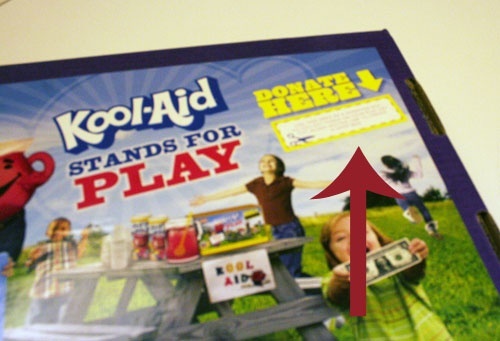 You get two canisters of delicious, Sugar-Free KOOL-AID to keep kids hydrated while they play! Play Day flags. Let folks know where to find your Play Day by tying these flags to a nearby tree. Flying disc. You can play disc golf, play catch, or make up a fun game to play! Chalk. What's a fun day outdoors without chalk? Jump ropes. See who can jump the most times without stopping! Orange and purple balloons. They're not just for decoration anymore! (Though they certainly can be.) Consider writing numbers or prizes on pieces of paper and inserting them in the balloons before you blow them up. Then let kids pop them to find out which prize they get. OR you can play balloon volleyball, or other number of games. Kazoos. Have kids add music to the day! Beach ball, pen, instructions and envelope. Get folks at your Play Day to demonstrate play is important by signing this beach ball and sending it back to KaBOOM!. We're going to collect all the beach balls and hold a big event on Capitol Hill with them...stay tuned for details! 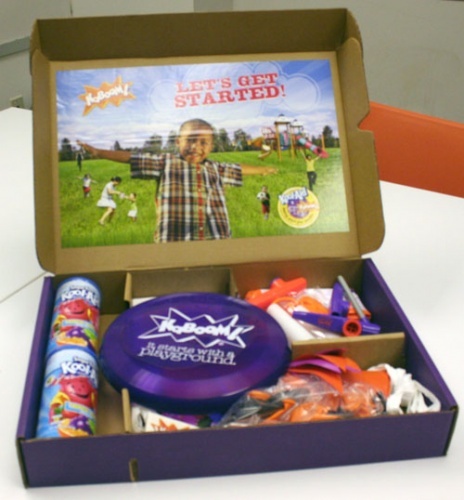 So how can you get one of these awesome kits for free? It's shockingly easy. All you have to do is plan a Play Day in your neighborhood to be held between Sept. 19 and 27 using our Play Day Planner. It doesn't have to be grandiose - it could just be an afternoon of games for the kids in your neighborhood! Even though September seems a long way away, in order to be eligible for a kit, you need to start using the planner and get through all the required tasks in Mile Marker 4 by Aug. 31. Get started today!